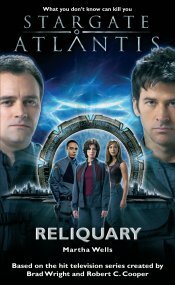 While exploring the unused sections of the Ancient city of Atlantis, Major John Sheppard and Dr. Rodney McKay stumble on a recording device that reveals a mysterious new Stargate address. Believing that the address may lead them to a vast repository of Ancient knowledge, the team embarks on a mission to this uncharted world. There they discover a ruined city, full of whispered secrets and dark shadows. As tempers fray and trust breaks down, the team uncovers the truth at the heart of the city. A truth that spells their destruction. The spiral design in the center of the chamber floor was moving, becoming three-dimensional as the little metal tiles forming it shifted fluidly. The whole floor was still vibrating, making the glass and metal debris jump and dance. Something groaned again below their feet, and the spiral began to sink into the floor. “I was imagining what?” Distracted, Rodney stepped sideways, moving along the edge of the shaft, craning his neck to watch the spiral’s progress.